Context. A year ago today. Thank you for signing Early Day Motion 767. This implies your support continued (if not increased) public funding of scientific research, along with many of your colleagues in the Coalition. Today we learned that science funding has been ring-fenced for the next four years. While I am happy that science funding has not borne the brunt of the CSR’s bad news, it is disappointing that your administration has not seen fit to invest in an area proven to deliver economic growth. But that is not why I am writing today. I helped organize the Science is Vital campaign, which saw over two thousand scientists and their supporters demonstrating outside the Treasury on Saturday 9 October. We arranged a lobby of Parliament and filled Committee Room 10 with over 100 constituents and some two dozen MPs. More MPs sent representatives. 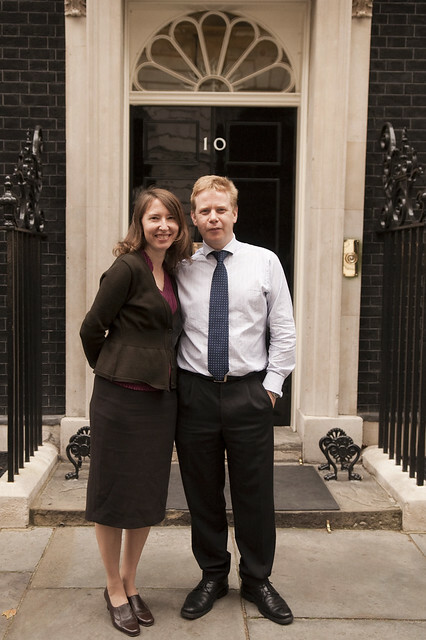 We delivered a petition of nearly 34,000 signatures to 10 Downing Street two days later. I wrote to you asking if you would care to meet me at the lobby—as did at least one other member of your constituency. We filed a green card to let you know we were there. You did not turn up, nor even have the grace to send a message. Now, I know that Vince Cable was speaking to the House at that time. We waited until questions had finished, waited until the chamber had emptied. You, I am told by somebody who saw you, met with other members of your party in the committee room next door—yet you did not attempt to meet me. I also wrote to you last May, about libel reform. You didn’t respond to that letter either. But you did send me a Christmas card. I’m not quite sure what to make of that. Do your other constituents wait in vain for a response from you on matters important to them? Do they, like me, make the effort to come to Parliament to talk to you (taking time away from their own work or family or leisure), only to be ignored, without being offered even the most basic courtesy? A message that you were unavoidably detained would at least have signalled you were aware of my existence. There is no room for complacency in democracy. If the people of a constituency feel that their MP no longer represents them, they will replace that MP with somebody else. This is not merely their right, but their duty. And the lesson I have learned from the Science is Vital campaign is that in a democracy, determined groups of quite unlikely citizens have extraordinary power. A question for the god-like entities inhabiting NPG: following yesterday’s speech by Vince Cable, was there a spike in traffic to naturejobs.com? Wahey. I’ve just installed the ‘Notify me of followup comments via e-mail’ plug-in for your delectation and delight. 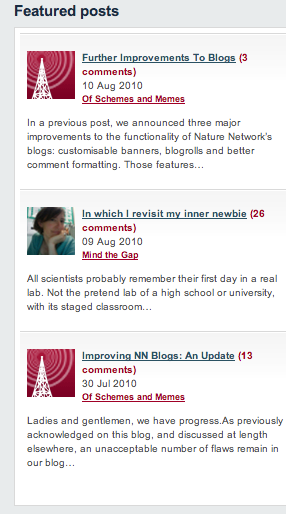 If I’m going to use this place as an alternative to Nature Network for your comments, it can only make life easier, right? In the last half of 2008 I consulted for the Science Advisory Board (SAB) on a study looking at How Online Media Affects Traditional Publishing Methods. This study was, like the RIN one, a survey of scientists and their use of social media, or ‘Web 2.0’ (by the way, there was a tweet on the #solo10 hashtag mentioning the Britishness of saying “two point nought” rather than “web two point oh”. Was that really me?). This was an international study, rather than the British-centric RIN one, and surveyed 1500 scientists (vs 1300 in the RIN one). What perturbed me on reading the RIN report was that the SAB study found that it was the younger and more junior scientists who were making more use of Web 2, whereas the RIN report seemed to imply that it was being driven by older scientists. In fact, one of my conclusions was that as the older guys died off we’d see more uptake. (Both studies bemoaned the low overall uptake of Web 2 tools, although the SAB was more upbeat in its assessment). But as I sat on the Tube on the way home last night, I realized there were a couple of major flaws with the RIN study. The RIN sent its survey to 12,000 scientists in the UK, and got a 10% response rate. That’s a pretty lousy statistic. Here, we’ve selected for people who have both the time and inclination to respond to a random survey. Most of the SAB respondents were selected from the SAB’s membership (currently nearly 50,000) to receive the questionnaire, and were rewarded for their participation (the SAB operates a points system: if you respond to questionnaires and whatnot you can accumulate points which can be exchanged for physical goodies). The response rate was a lot higher (I don’t have the exact numbers to hand) and we might assume that the quality of response was correspondingly higher, too. A more worrying question, however, is how were those 12,000 people (who received the RIN survey) selected in the first place? Turns out that these are ‘scraped’ email addresses, which makes me think there was already some bias towards older, more well-established scientists in the first place. Young researchers not only have had less time for their contact details to be established on an institutional website (and indeed, pre-tenure, have probably moved around a lot, relatively speaking. Google me, for example; the second hit is me but the email address in it was defunct five years ago) but are possibly also more security conscious and less willing to have their email address available for scraping. I think those two concerns might well go some way to explaining the ‘surprising’ results from the RIN study. This is a room full of very special people <fx: laughter>. If we didn’t believe in online technology, the value of it and the coolness of it, we wouldn’t be here today. And over the last couple of days we have seen some very neat stuff. This morning, Aleks talked about the Growing Knowledge project; Peter Murray-Rust showed us a really cool experiment this morning, and we’ve had a whole heap of open- and linked- data stuff–semantic web, if you like. Real nerdgasm stuff. But, we have to remember, we are special. We are the early adopters, if you like. To borrow a phrase from technology business development, we haven’t yet crossed the chasm to mainstream adoption of these cool toys, as Rob has just pointed out. The vast majority of jobbing scientists simply haven’t signed up yet, perhaps for the reasons Rob listed. We, here in this room, are a load of technology evangelists, there are a few companies here who share that vision and who have demonstrated some of their toys, but people as a whole? Of course, they’re into Web 1–email and websites and whatnot, but Web 2, Web 3? Not so much. We’ve given reasons over the last two days why people should adopt these technologies, but there’s been a lot of stick, and not enough carrot, I feel. What should we do? Encourage–or bully–people into using this stuff, just because it’s there, just because it’s cool? I think, rather, that it comes down to two things, and my thesis is very simple. People, as a whole, will only adopt these new technologies for one of two reasons. First, these new tools allow you to do something necessary, something you have to do anyway, something that exists outwith cyberspace but that you have to do, but that is made so much easier, so much more efficient with internet tools that people will WANT to do it. Obvious examples are PubMed–anybody remember Silver Platter?–and online journals themselves. When did you last use a photocopier to copy a journal article? Say what you like about PDFs, didn’t life get a lot lot easier in the late ’90s and early 2000s? The second thing that works is something that adds value, and that value can include ‘fun’, but a value that just can’t be gained from anywhere else. A compelling value. For example, Facebook and Twitter are great Web 2 tools that allow people to communicate in new and exciting ways. It’s slightly less Web 2, Web 1.5 perhaps, but Faculty of 1000 I think is such a tool. We’re addressing the filtering, the information overload problem, adding value to the published research. We don’t care, actually, whether it’s Open Access or where it’s coming from: we’re just providing editorial, if you like, content on top of the literature. And you can’t do that, effectively, without cyberspace. It won’t work. The challenge, really, is not to have a smart idea. There must be oh, how many people are here? 120 bright ideas in this room alone. But you have to figure out where that value is, that compelling calue that will make the vast majority of scientists want to use this stuff we’ve been talking about. This includes things like blogging networks, like data visualization, like linked datasets. and then we were out of time. There was some ad-libbing in there, but that’s the gist. Oh, and I had no slides. I’d LOVE it if ONE scientist would take on the challenge of CLEARLY explaining the scientific method. Wikipedia sure doesn’t. Martin Robbins took up the challenge straight away, but in the interests of clarity (and non-jargon) I’d like to see suggestions that might replace the Wikipedia entry. As far as I’m concerned, these explanations should be lay-readable; understandable to a high school student, say. Please feel free to have a go, and then, seeing as the Wikipedia article is the first Google hit for ‘scientific method’, let’s edit the bloody thing to something more like.